Home » Blogs » What “Missed” Call? 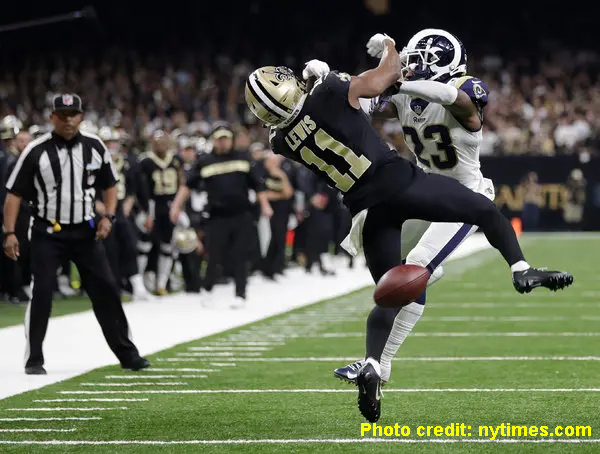 The recent furor over the “missed” call in the Saints-Rams playoff game in New Orleans involving Tommy Lee Lewis and Nickell Robey-Coleman is an interesting situation. But to me it’s interesting for reasons that I haven’t heard discussed yet in any other media outlets. Riddle me this, Batman. Why is this referred to as a case of a “missed” call? This implies that somehow the officials involved didn’t see the play so that they missed making the call, that their vision of the play was somehow impaired or obstructed. This is obviously not the case, though, is it? If you’ve seen replays you know, as does everyone else, that the officials in question – and there were two of them in particular although all seven are ultimately responsible – were in perfect position to see the play and were no more than 10 or 15 yards away. In fact they were perfectly positioned to see it which was the only thing they did right. In the play you can see them staring right at the players with nothing obstructing their views. The play happened on the sideline so there were no other players around and certainly nothing to distract them from seeing what happened. So in reality, they didn’t “miss” the call. They saw everything. To say they missed the call is misleading and deceptive. They didn’t miss a thing. They just didn’t throw a flag. Two of them. It’s incomprehensible why they didn’t make this call because everyone in the world saw what happened. And what happened was the most blatant example of pass interference that you will probably ever see. So, first question: why didn’t they throw the flag? They saw it. That’s indisputable. It was pass interference (forget the helmet to helmet contact, I’ll get to that). That’s indisputable. So why no flags? This is the $64,000 question and no one has addressed this issue. Why not? These officials should be put in a room somewhere, with a video camera on them and grilled until a satisfactory answer to this question is given. Obviously, this will never happen because the NFL would never allow it and the league office probably doesn’t care enough to know anyway. Question number two is why didn’t Bill Vinovich, the referee and head official, do anything? Did he also “miss” the call? How could he not have seen anything? He would have been within his rights to drop a flag, as of course any of the four other officials could also have done, and call a penalty. I understand that a review could not have been done because it was not reviewable play but any of the officials on the field could have called a penalty. So what they’re saying is that all seven of the officials on the field saw nothing? Ridiculous. Question number three: why wasn’t Robey-Coleman called for a helmet-to-helmet hit? Even if the refs didn’t think it was pass interference it was clearly an illegal hit. We’ve seen the officials call this all year long and in most cases the calls were made on plays that were much less egregious than this one. Robey-Coleman went straight for Lewis’ head. He made no attempt to hit him legally at all. So why wasn’t this called? And the follow-up question: why wasn’t Robey-Coleman fined by the league? Plenty of other players have gotten fined for hits like this after a game. Why not Robey-Coleman? Did the league office review this play and decide that it was not an illegal and, to be perfectly clear, a dangerous hit on a defenseless receiver? Is this what they would have us believe? This is total BS and anyone who knows anything about the NFL knows this too. This was nothing but a dirty play and Robey-Coleman is, in my opinion, a dirty player. Lewis could have been really hurt on this play and it seems as if these game officials could have cared less. Is this in line with the NFL’s attempt to make the game safer for the players as we keep hearing about constantly? The whole situation stinks to high heaven and only further serves to undermine the integrity of the league, which has taken numerous hits itself since Roger Goodell took over as commissioner. It would take a whole other column to list those transgressions. Something funny went on here and it’s nothing to laugh about. Especially for anyone involved with the Saints organization or one of their fans, but also for anyone who’s a fan of a great game that was made to look cheap, underhanded and just plain stupid last Sunday.